Rather be the hunter than the prey. Ella Maria Chauncey walks home after a night out with her friends, hurrying to get back before her parents realize she’s been out with the boy they don’t want her to date. Living in the gated community of Lyford Cay, Bahamas, in one of the world’s wealthiest neighborhoods, she believes it is safe. Ella Maria never makes it home. She is found the next day floating in her family’s pool, her tongue cut out. Seven months later Jack Ryder is visiting the Bahamas with his adopted daughter Emily. They’re trying to find Emily’s relatives, but it turns out to be easier said than done. The only living relative they can track down is a woman…in jail. She’s doing time for murdering Ella Maria Chauncey, but as Jack digs into the case, he starts to wonder if she was wrongfully convicted and the murderer is still out there, hunting for his next prey. As the shocking investigation unfolds, and secrets are revealed, no one in in the lucrative Lyford Cay can be trusted. This fast-paced bone-chilling mystery by #1 Amazon Bestselling Author Willow Rose will have you glued to the pages late into the night. 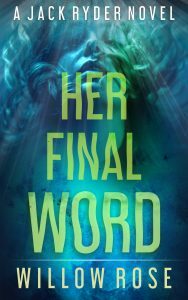 HER FINAL WORD is the sixth book in the bestselling Jack Ryder series but can be read as a standalone.